released 2001 Musical Tapestries Inc.
From art song to Broadway to classical cabaret, Out and About contains the sparkle of theatricality and a wonderful sense of humor--from delightful culinary tales and passionate, sentimental love songs to the dark ambiance of temptation and seduction. 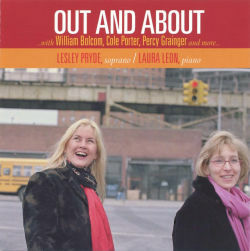 This CD brings together William Bolcom's scintillatingly dark Song of Black Max (as told by the DeKooning Boys) and his deliciously hysterical Lime Jello, Marshmallow, Cottage Cheese Surprise, Cole Porter's The Tale of The Oyster, and songs by Lee Hoiby, Richard Hundley and Australian composer Percy Granger. And, Stephen Schwartz's beautiful and quietly passionate gem With You from the spectacular Broadway show Pippin, for which he composed both the music and lyrics. Pippin just opened on Broadway on April 25, 2013 to rave reviews, following its successful original run 40 years ago!